I am so excited to show you a little makeover I completed using Martha Stewart Crafts products from Plaid. 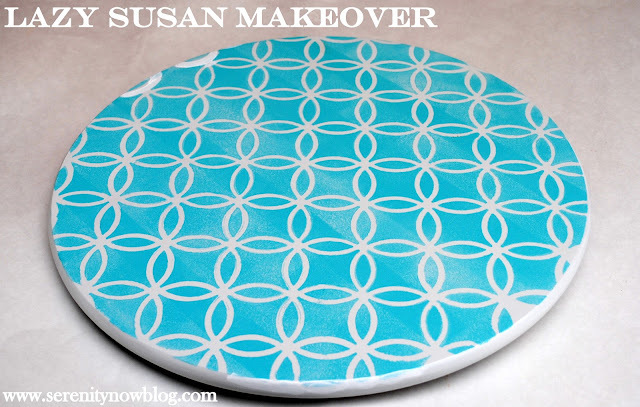 I took a plain Lazy Susan from IKEA and gave it a little pizzazz. With an updated look, it will make a perfect Mother's Day gift. 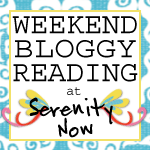 I tested it out in my kitchen and the craft area, and I love that it can do double-duty! You might remember my little sneak peek and video post from last week. 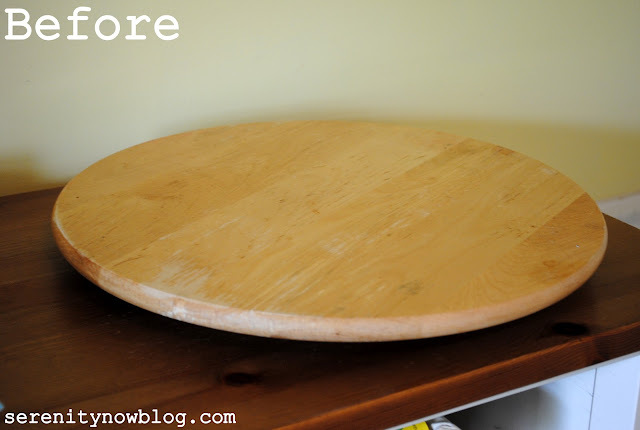 Did anyone guess that I chose to repurpose a Lazy Susan for my Mother's Day craft project? I sure had fun with all of the lovely supplies! 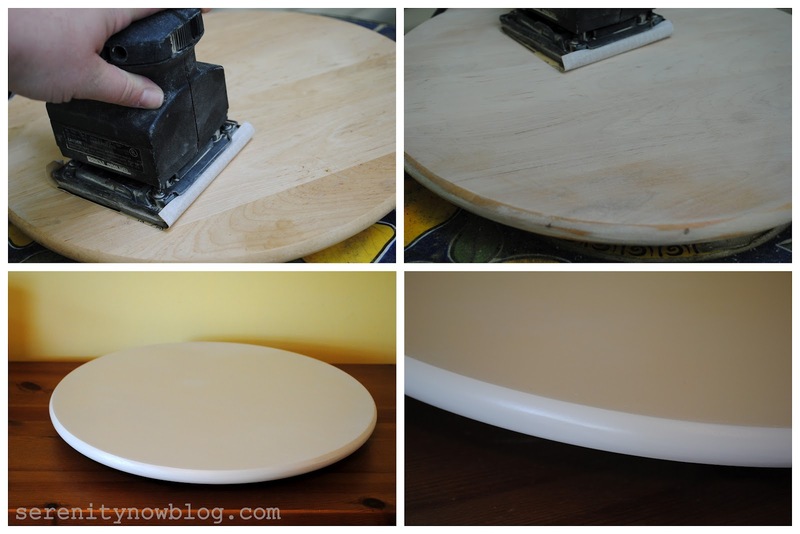 I started my project by sanding the top and sides of the piece down and giving it several coats of plain white paint. Already an improvement! I wanted to take extra precautions, so I let the spray paint "cure" for a day or two before I started the stencil job. The stenciling was easy because of the excellent quality of Martha Stewart's products. 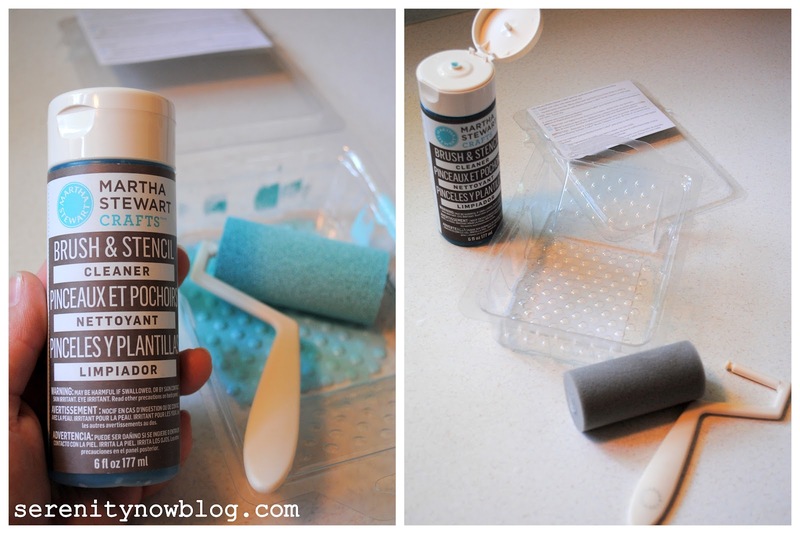 I've used cheap sponges and brushes before, and there truly is a difference! Because my stencil had an intricate pattern that would need to be lined up, I made sure to practice with a pencil and a manila envelope before stenciling on the Lazy Susan. 1. 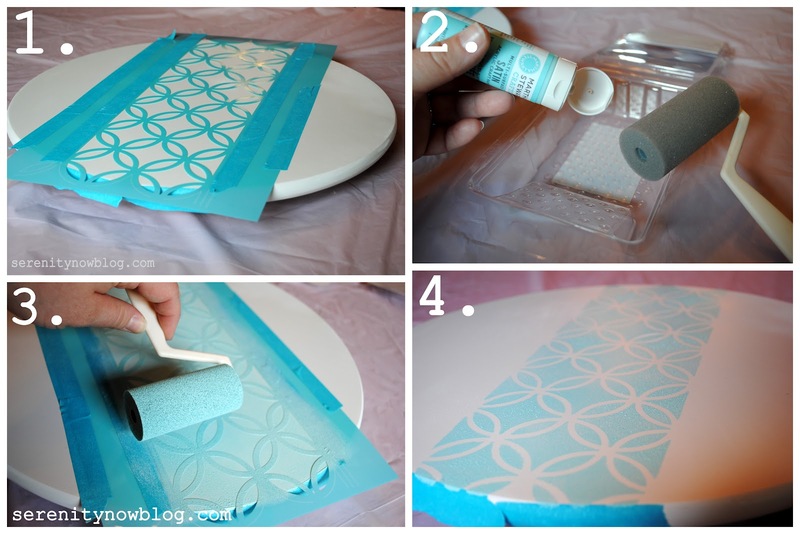 Tape your stencil firmly onto the piece you want to paint. Be sure to use adhesive tape to cover parts of the stencil you don't want painted. 2. Follow the instructions on the box to prepare your roller and then add paint to the tray. 3. Roll paint onto the stencil quickly and smoothly. Be careful not to press too hard, or paint will seep under the stencil. 4. 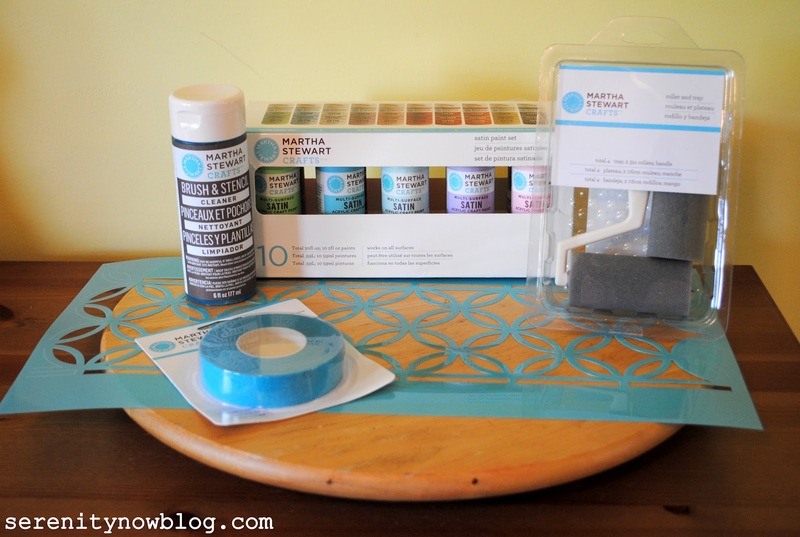 Peel stencil away while paint is still wet and admire your clean lines! Wait 30 minutes to 1 hour before re-positioning the stencil over top of the painted area. 5. When the first painted section is dry, line your stencil up for the next area to be painted. Again, be sure to tape down areas you don't want painted! 6. Make note of any areas that need to be touched up. 7. 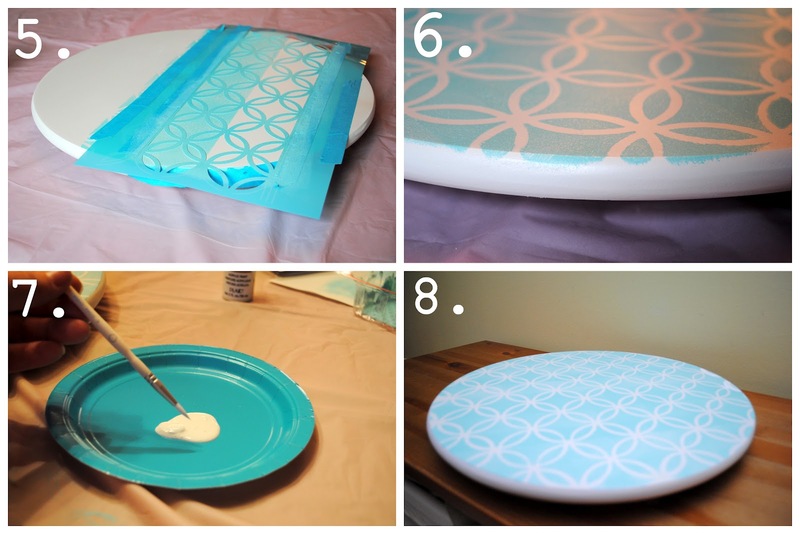 Add some extra paint to a paper plate and use one of the Martha Stewart basic brushes to fill in any spotty areas. 8. Allow your work to "cure" for a day or two. You may want to consider adding a layer of polyurethane or a clear coat to seal everything in, especially if the piece will get a lot of use or wear. Clean up was a breeze with the Brush and Stencil Cleaner. A very small drop was all I needed to lather the brush and tray up and restore them to like-new condition! Now you can admire your work! 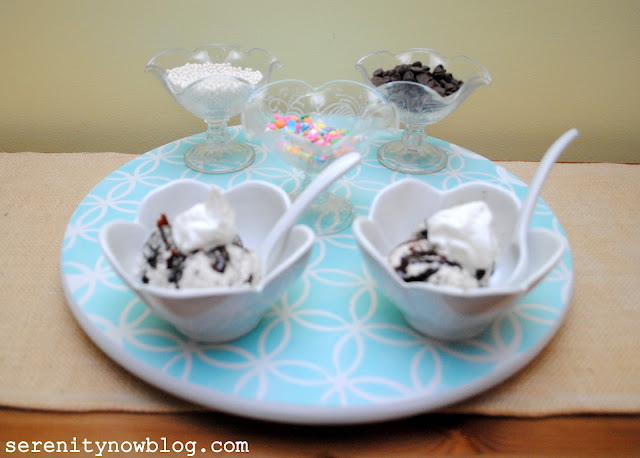 I love how simple this was to do, and it would be so cute in a craft room or in your kitchen. It's always fun to take an ordinary household object and transform it into something that better reflects your personality. 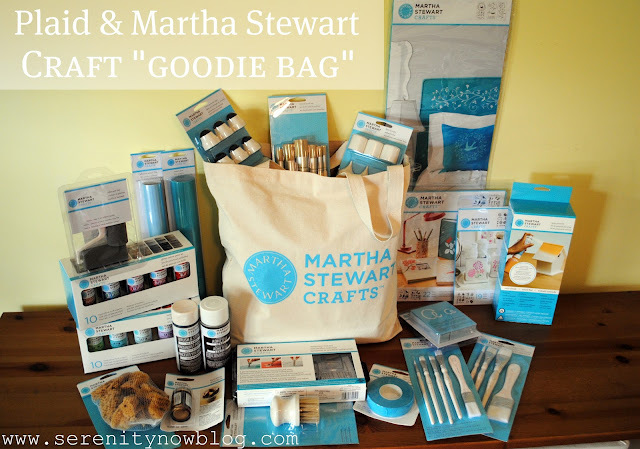 If you'd like to find out more about Plaid's Martha Stewart Crafts line, you can connect through Twitter, Facebook, and even Pinterest. Thanks to Plaid and Martha Stewart Crafts for your generosity, and for producing quality craft supplies! If you enjoyed this post, I hope you'll click the "Pin It" button to add this project to Pinterest, or even a +1 for Google+. Disclosure: I wrote this post as part of a paid campaign with Plaid and BlueprintSocial. The opinions in this post are my own. I've been wanting a wood lazy susan to pretty up for a while now! This makes me want one even more! Great job. Now if only there was an Ikea in Vermont. I have that exact lazy susan somewhere! What a great idea to paint it and give it a little facelift! That stencil pattern is one of my favorites by Martha Stewart! It turned out so pretty! Beautiful Amanda! The blue you chose & stencil are so classic, you'll be able to use that lazy susan for a long time. :-) Thanks for sharing! I have never been a fan of Lazy Susans because usually they look like yours did before you painted it. It looks a lot better painted and doesn't look like it belongs in a grandmother's kitchen anymore. I love how paint makes such a great transformation. I love it, Amanda! Excellent job. I'd love to get a bag of craft goodies in the mail. Can't wait to see what you make with some of the other things. =) Your stencil reminded me of my bedding. It looks nearly identical! Check it out. Anyway, hope you had a nice birthday and enjoyed that tasty looking cookie cake! I have the Ikea one which i bought last summer and I've had plans to stencil ever since. It hasn't happened. Maybe this will give me the inspiration I need to do it. Looks great! I have that exact lazy susan collecting dust atop my fridge! Now I know what I'm going to do with it! And I love Missi's idea to use it on the office desk! It turned out great, Amanda! I love to stencil. . . I used to be quite a stencil pro back in the day. 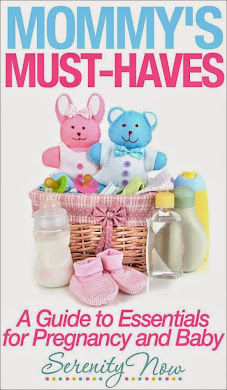 . . but I haven't tried any Martha Stewart products. Sounds as if they'd be worth it! Congrats on getting a box of goodies to try--I know that was just like Christmas! Wow,this is fabulous,I love the colours! I recently found a two tier lady Susan in a charity shop and am planning on giving it a new life as a craft caddy, thanks for the great tutorial !! This is really nice I love how it turned out. This turned out great! I love both your stencil and paint choices. I think you should keep this for yourself! I want a Lazy Susan! Especially one as cute as this one is now! Big difference! So pretty and bright! I love this. That is darling! So much more personal than one fresh off the shelf of a store. Love this! What a cute idea! Would love for you to stop by and share at the Pomp Party! This LazySusan is awesome!! Love the stencil design. Martha Stewart is definetely the "Queen" of the crafty world! !